After successful installation using the Plesk autoinstaller, you will be provided with a one-time login URL that contains a session token. Follow this URL to automatically log in to Plesk. 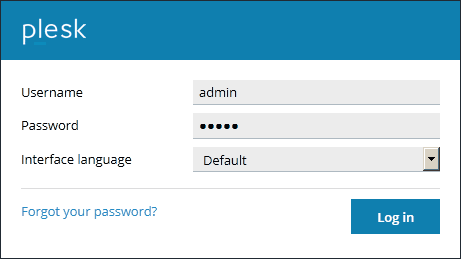 Select the desired interface language, change your password and log in to Plesk with a new password. The Plesk login page will open. Type in your username and password to log in to Plesk. By default, your username is admin, but this may have been changed if Plesk was pre-installed by a third party. Alternatively, you can log in to Plesk using the root username (on Linux), or the administrator username (on Windows), and the corresponding password. Note: You can disable logging in to Plesk with the root or administrator credentials by adding the lines below to the panel.ini file.